I'm so excited to be participating the Backyard Art Camp series organized by Melissa of A Happy Stitch and Jane of Buzzmills. They recruited a bunch of bloggers to come up with projects for kids based on the work of established artists. I've been really enjoying the series and I think you will, too! Make sure to click over to the other projects at the end of this post. I based my project on the work two illustrators I admire: Jaime Zollars (who happens to be a dear friend and an all around awesome lady) and Lisa Congdon (who is also awesome; just read her blog). Both artists have a series of work in which collage is integrated into more traditional pencil drawings: Jaime, in her Society of Seekers series and Lisa, in her Nordic inspired work. Fallon; She who seeks strength by Jaime Zollars (left) and Sami Woman by Lisa Congdon (right) shown here with permission from the artists. I love how both artists integrate graphic elements through the use of collage into their delicate pencil drawings. The juxtaposition between detailed rendering and flat color creates an interesting tension that I'm really attracted to. I knew the kids would enjoy this technique and that it would allow them to achieve an effect they couldn't otherwise. The fact that the kids are familiar with the work of these ladies is an added bonus! We own The Dictionary of Ordinary Extraordinary Creatures illustrated by Lisa Congdon and Inside the Slidy Diner illustrated by Jaime Zollars. Two favorites in our house. 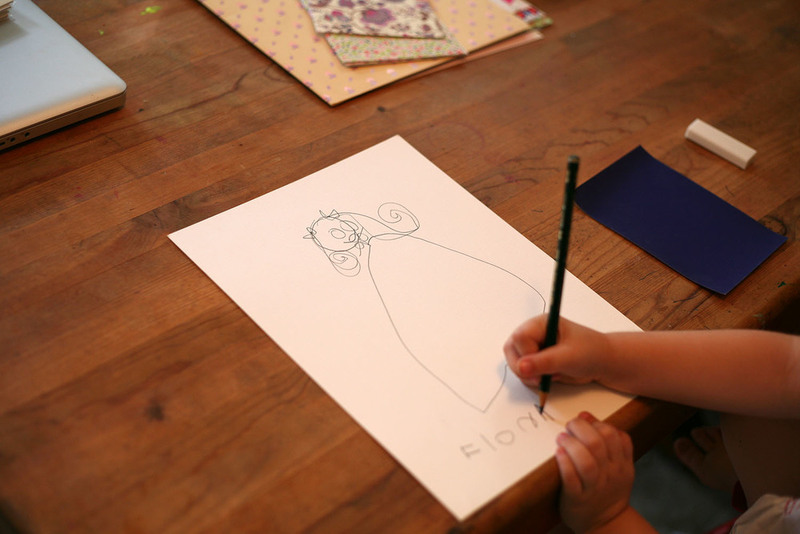 Fiona (4 years old) and Elijah (8 years old) both created great final pieces, but most importantly, enjoyed the process of drawing, tracing, cutting and gluing. I've outlined the project below, so let's get on with it! I started out by presenting the project to the kids. 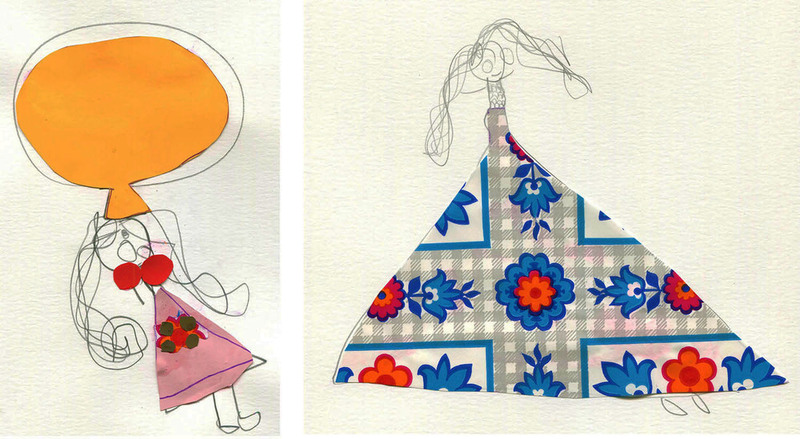 I showed them this collection of images and explained how the artists achieved the look by creating a pencil drawing, cutting shapes out of paper for clothing and accessories, then gluing those shapes on top of the original drawings. I emphasized the process much more than the result to the kids. These examples are created by accomplished professionals after all and we don't want to intimidate our little artists! Draw a person wearing simple clothes. Choose which colored or patterned paper to use for each piece of clothing. 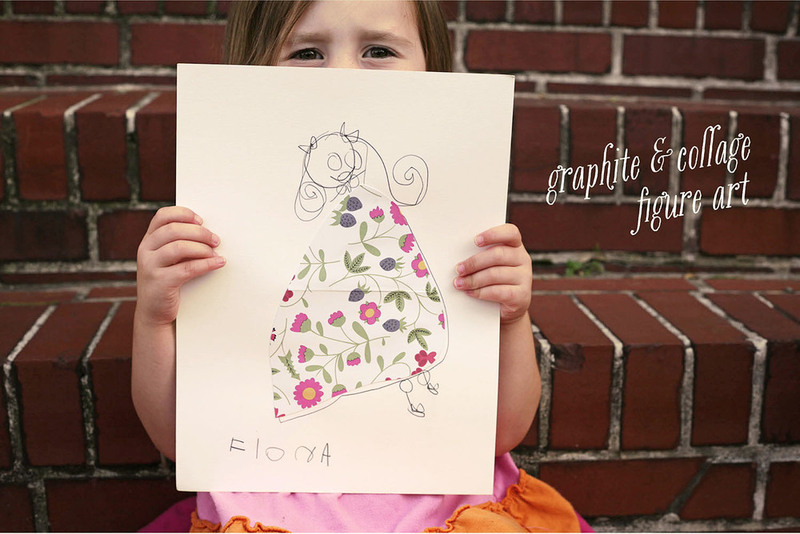 In Fiona's first drawing, she chose to make the dress a pretty floral using one of my Liberty Notecards! Nice taste, little lady! Place the pencil drawing on the light board with collage paper on top. Keep in mind that if the collage paper is too dark, it will be hard to see through to the drawing underneath. If you don't have a light board, another option is to tape the drawing and collage paper to a bright window and trace it there. Trace the outline of the clothing or accessory with a dark marker or pen. Cut out the shape traced on the collage paper following the marker line. Fiona needed help with this step for her more intricate details. Elijah was good to go all on his own. If the kids need help cutting, don't hesitate to give them a hand! Glue the collage paper onto the original pencil drawing in the correct position. Fiona got increasingly detailed with her collage on each drawing as she started to fully understand the concept. Elijah spent the whole time working on a single piece. Artists work at their own pace, even the little ones. Respect their process! Fiona wanted a lot of feedback; Elijah was content to work on his own. I expect that this will be an idea we return to again and again. It feels good for them to add one more technique to their creative tool belt. Pointillism with Jane from Buzzmills.